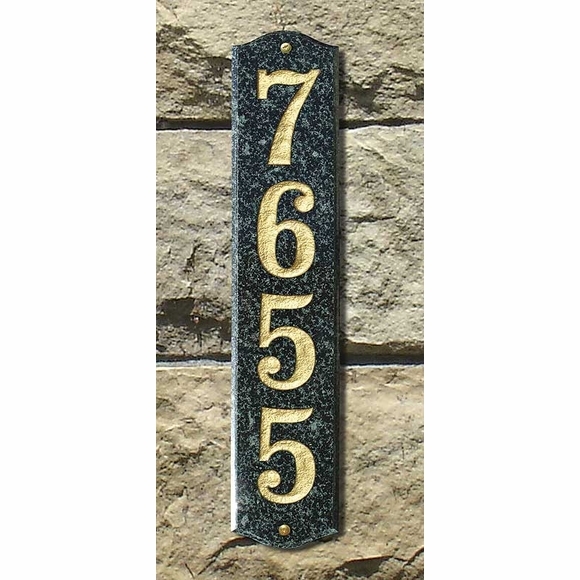 Vertical Address Sign - - Solid granite vertical address plaque features up to four bold numbers deeply engraved in solid granite, adding stately elegance and curbside appeal to any home. Select from a variety of granite colors and number colors to match your home decor. GRANITE COLORS: autumn leaf natural, black polished, black natural, emerald green polished, five color natural, quartzite natural, sand granite polished, white granite natural. NUMBER COLORS: black, white, mocha, gold. Dimensions (approximate): 4"W x 19"L.